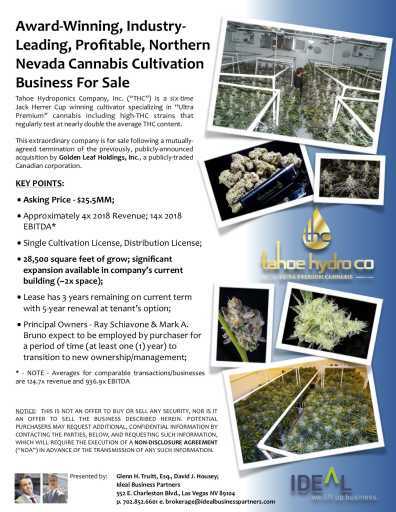 Tahoe Hydroponics Company LLC, (THC, or the Company) is an award winning, licensed, profitable, and growing, cultivator of ultra-premium cannabis. Located in Carson City, Nevada, THC also holds a marijuana distribution license which, along with the cultivation license, allow THC to operate throughout the state of Nevada with the exception of the city of Las Vegas. The Company’s principals are seeking an exit to a private or public, financial or strategic purchaser. THC have a demonstrable track record of increasing revenue, net income, EBITDA, and free cash flow and are preferred suppliers to some of the most exacting customers in the industry. The information contained in this email may be considered to be a general solicitation of and general advertising for the sale of exempted securities to accredited investors under Rule 506(c) of the Securities Act. As such, prior to the sale of any security to any investor, the company must and will take reasonable steps to verify that all potential investors are accredited investors, and such reasonable verification steps may include, but are not limited to: (1) Reviewing copies of any IRS form that reports the income of the purchaser and obtaining a written representation that the purchaser will likely continue to earn the necessary income in the current year; and/or (2) Receiving a written confirmation from a registered broker-dealer, SEC registered investment adviser, licensed attorney or certified public accountant that such entity or person has taken reasonable steps to verify the purchaser’s accredited status.